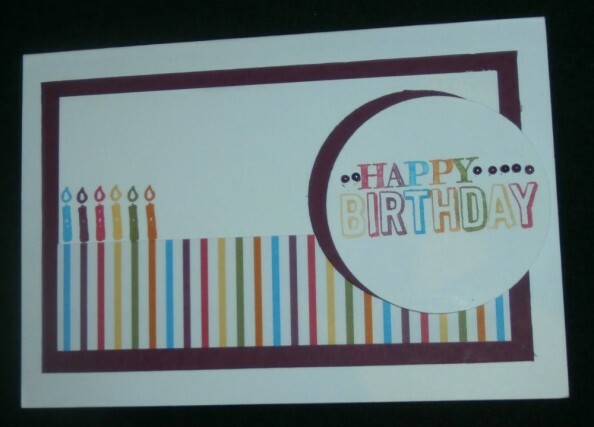 Home ▸ Blog ▸ General ▸ Card ideas and projects ▸ Big Day Birthday! The candle and the letters on the sentiment have been inked using Stampin’ Write markers in order to match in with the stripes on the DSP panel, and grounded using a solid colour card base of Rich Razzleberry. The stamp set is called “Big Day” and is birthday themed. The images are sketched, and are designed to be used with the brand new chalk inks and chalkboard paper in the new Spring/Summer seasonal catalogue. But obviously they also work really well with our “standard” inks and card! If you would like to get your Big Day stamp set, then just place an order with me for £45 or more, and you can choose this stamp set in either wood mount or clear mount, or indeed any of the other SaleABration stamps sets or accessories instead. If you get a pack of markers, the circle punch used on this card, and some cardstock, you are well on your way to the £45 order requirement. And just think how many lovely birthday cards you could make with that little kit! Tons and tons! Have a great day, and I will be back tomorrow with the new weekly deals and another project. I have also taken some step-by-step photos of the gift bag project which we made at the Open House event on Saturday to upload this as a new project for the website. I’m not sure exactly when that will be uploaded, but I will try to do it soon. Thanks to everyone who came on Saturday – a great time was had by all and we did lots of sharing and sticking. Hopefully we have some new crafters, and a couple of them have taken up the Project Life offering so I really hope they love it as much as I do! If you didn’t see the photos and sharing on facebook and twitter, then be sure to check those out – Gary took some sneaky photos while we were playing, and shared them with the world!! Enjoy. Colours: Daffodil Delight, Melon Mambo, Old Olive, Pumpkin Pie, Rich Razzleberry, Tempting Turquoise, Whisper White. Accessories: Designer Series Papers, Many Marvellous Markers.